[119 Pages Report] The study involved four major activities to estimate the current Hospital EMR Systems Market size for algae products. Exhaustive secondary research was done to collect information on market, peer market and parent market. The next step was to validate these findings, assumptions, and sizing with industry experts across value chain through primary research. Both top-down and bottom-up approaches were employed to estimate the complete market size. Thereafter market breakdown and data triangulation was used to estimate the market size of segments and subsegments. In the secondary research process, various secondary sources such as Centers for Medicare & Medicaid Services (CMS), Centers for Disease Control and Prevention (CDC), Healthcare Information and Management Systems Society (HIMSS), US Department of Health & Human Services (HHS), American Medical Association (AMA), Canadian Institute for Health Information (CIHI), Canada Health Infoway, , World Health Organization (WHO), European Commission, Japanese Ministry of Health, Labour and Welfare (MHLW), Australian Healthcare and Hospitals Association (AHHA), Ministry of Health & Family Welfare (MoH&FW) of India, Ministry of Health (MOH) Singapore, Dubai Health Authority (DHA), have been referred to, so as to identify and collect information for this study. These secondary sources also included healthcare IT news, annual reports, press releases, corporate presentations, press releases, industry journals, and databases. The EMR solutions market comprises several stakeholders such as Healthcare IT service providers, healthcare insurance companies/payers, healthcare institutions (medical groups, physician practices, and outpatient clinics), research and development companies, venture capitalists, Government agencies, corporate entities and market research and consulting firms. The demand side of this market is characterized by government support for the adoption of the EMR solutions. The supply side is characterized by advancements in technology. Estimating the adoption rate (%) of EMR hospitals to arrive at the total number of hospitals that use these solutions in the US. All percentage shares, splits, and breakdowns have been determined using secondary sources and verified through primary sources. After arriving at the overall market size using the market size estimation processes as explained above—the market was split into several segments and subsegments. In order to complete the overall market engineering process and arrive at the exact statistics of each market segment and subsegment, the data triangulation and market breakdown procedures were employed, wherever applicable. The data was triangulated by studying various factors and trends from both, the demand and supply sides. in the EMR market. Cerner Corporation (US), Epic Systems Corporation (US), athenahealth, Inc. (US), eClinicalWorks (US), Allscripts Healthcare Solutions, Inc. (US), Medical Information Technology, Inc. (US), MEDHOST (US), CPSI (US), and Intersystems Corporation (US). 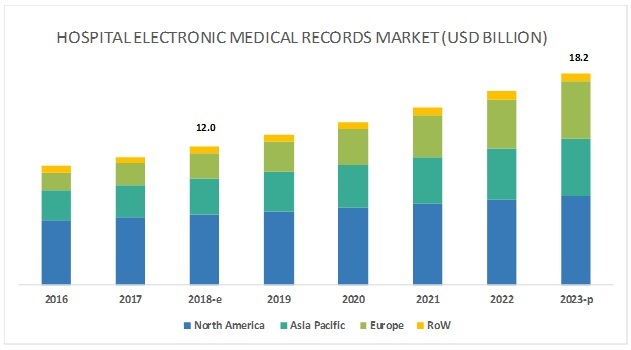 The global hospital electronic medical records (EMR) market is valued at an estimated USD 12.0 billion in 2018 and is projected to reach USD 18.3 billion by 2023, at a CAGR of 8.8% during the forecast period. 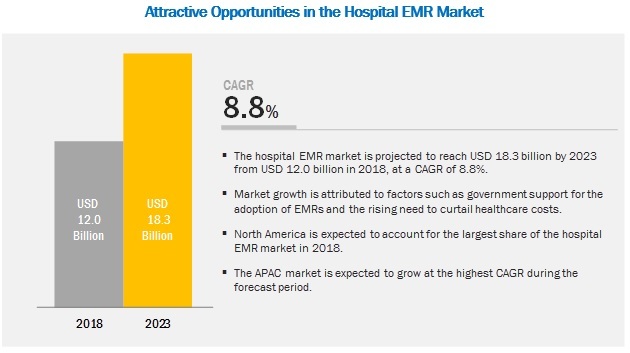 The growth in this market is primarily attributed to factors such as government support for the adoption of EMRs and the rising need to curtail healthcare costs. The global hospital EMR market is segmented on the basis of component, mode of delivery, type, and region. By component, services segment is expected to be the largest contributor in the hospital EMR market during the forecast period. The healthcare IT industry relies heavily on service providers for consulting, storage, implementation, training, maintenance, and regular technology upgrades. Introduction of complex software and the integration and interoperability of software, which requires extensive training and upgrades is expected to boost the demand for services in the coming years. In the EMR type, the general EMRs segment is expected to register highest CAGR during the forecast period. General EMRs are designed for use by universal practices. They have all the functions of EMR, such as CPOE, clinical decision support, controlled medical vocabulary, clinical data repository, ordering, and billing. Due to their multi-function, multi-specialty capabilities, these EMRs can be used in various specialties through flexible functioning and incorporated plugins. North America is the major revenue generating region in Hospital EMR Systems Market. Federal mandates in the US, growing digitalization in healthcare coupled with favorable government policies, and continuous support in the form of grants by the federal government in Canada are some of the factors contributing to the large share of this segment. The major vendors in the hospital EMR market are Cerner Corporation (US), Epic Systems Corporation (US), athenahealth, Inc. (US), eClinicalWorks (US), Allscripts Healthcare Solutions, Inc. (US), Medical Information Technology, Inc. (US), MEDHOST (US), CPSI (US), and Intersystems Corporation (US). In 2018, the Veterans Affairs Department in the US announced the implementation of the Cerner EHR system. The deal size was USD 10 billion. In 2018, Mayo Clinic Rochester (US) went live with the Epic EHR system and completed a massive overhaul of nearly all of Mayo’s computerized systems. The deal size was USD 1.5 billion. In 2018, Epic launched Sonnet, an EHR solution designed for the smaller hospital with fewer modules and a reduced feature scope. In 2018, MEDITECH established MEDITECH UK with the aim of delivering Expanse to customers in the UK and Ireland. This expansion was aimed at increasing the company’s global presence and customer base. What are the key strategies adopted by the players in this market? Which regions provide high growth opportunities? 12.5 Allscripts Healthcare Solutions, Inc.